There is this newish thing in the vegan world called aquafaba. Aquafaba is the name for the viscous water that results after cooking beans. It comes from “aqua,” water and “faba,” bean — bean water! This miracle stuff can be used as a substitute for egg whites and you can make things like meringue and marshmallows and whipped cream out of it. Don’t worry if you have never heard of it. It is a fairly recent genius development that came about in 2014 when a French chef began experimenting with it. Soon others in France began experimenting and not long after that an American software engineer and vegan took up the challenge (and created the word aquafaba). He discovered that aquafaba could completely replace egg whites and started a Facebook page in 2015 where he revealed that egg-free meringue can be made from the cooking liquid of chickpeas and sugar. And now there is a whole community experimenting and sharing their recipes in an amazing open source kind of way. Word is that chickpeas make the best aquafaba. So with Thanksgiving and pumpkin pie to look forward to, I found a recipe for Bookman to make a kind of marshmallow cream whipped topping for the pie. Just the anticipation sent me over the moon. You see, we’ve never been able to make our own satisfactory whipped topping and we have tried coconut cream and a few other things. If you have ever looked at the ingredients of vegan whipped topping at the grocery store, you would be appalled at all of the fake, unpronounceable things in it. So we have satisfied ourselves with a sprinkle of chocolate chips on top of our pumpkin pie, which, really, is pretty darn good. But a whipped topping made from chickpea water, some sugar and a little vanilla extract? Could this be real? Behold! It is soooo good! It took a lot of blending to get it whipped up, but so worth it. And since it is made from bean water it is high in protein and low in fat — nutritious if you forget about the sugar. Heh. Bookman is now tasked with learning more things to make with the stuff and I have dreams of lemon meringue pie someday. And marshmallows. We rarely have marshmallows because a bag of vegan ones costs close to $6. So making rocky road ice cream or s’mores is an expensive and uncommon undertaking in this house. That might be about to change! The weather has gone from early cold to late warm. We set a record high temperature on Friday of 60F/15C! Mornings are still at or just below freezing though. This morning I caught Bookman making the Dashwoods some hot buckwheat groat porridge. When I walked into the kitchen he got a guilty look on his face because it is usually us eating the buckwheat groats and breakfast was long over. When he admitted they were for the Dashwoods I just laughed and laughed. When I first suggested we get chickens he was adamantly opposed to the whole idea and now here he is making them hot porridge on a cold morning! Yes, I tease him regularly about this, but he is a good sport. The only Black Friday shopping I did was online and will you be surprised that it was garden related? Pinetree, the place I get most of my seeds from, was having a 15% off the entire order sale. Since I had their 2018 catalog in the mail already a week ago and had gone through it and decided what I wanted I saw no reason to not take advantage of the discount. We haven’t had much luck with tomatoes the last couple years so we will be trying a few different varieties. Same with peppers. We are going for small and spicy instead of big and sweet. And since I finally found the carrot that likes my garden, I decided to not give up on beets and got a variety I have not tried before in hopes that this might be the one. There was also lots of greens in the order — lettuces, spinach, mustard, kale and the like. The only downside of ordering now is that I have so much longer to wait before I can even think about starting the seeds. At least when I order in January I get to start the tomato and pepper seeds in February. More time for daydreaming, right? Sounds interesting I want to try it. Please, it is really amazing all the things you can do with it! I never heard of aquafaba but it sounds really awesome. I’m not vegan, but I’d rather make something yummy from bean water than pour it down the drain or dampen my worm bin with it! Looks like your chickens sure enjoy hot breakfast. 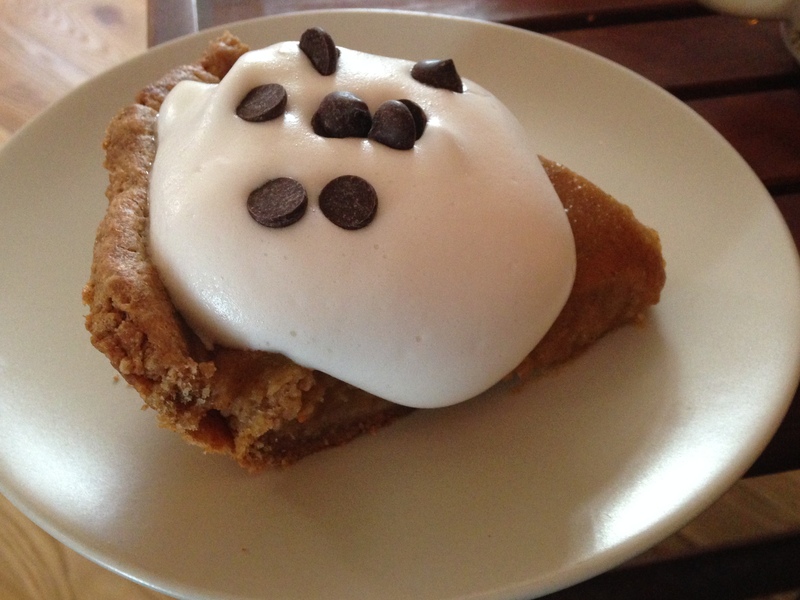 That pumpkin pie looks so good! Aquafaba sounds like a brilliant idea. Buying seeds online is a good thing to do on Black Friday 🙂 I went for a long walk in a local park and stayed far away from stores. Brian Joseph, thanks! Heh, yeah, buying seeds on Black Friday seemed like a semi-anticonsumerism thing to do. Your long walk sounds lovely! Hope you both had a great holiday! The aquafaba sounds like a very very good option! You know the funny thing – in our part of the world, where many are vegetarian, have been using the water from boiling of beans,chickpeas and other legumes and adding it with a dash of vegetables for a nourishing broth! But using it as a cream option…wow! that is cool! Bookman was so sweet about cooking the Dashwoods a hot breakfast! I am sure they enjoyed it! That picture has made me hungry and I am drooling like Anu Boo, Stefanie. Aquafaba for the win indeed! I’ve been reading about aquafaba for several years but I’ve never tasted it or tried to make it. After we get settled (we’re right in the middle of a gradual move), I’d like to try to make it. I long for lemon meringue pie, too! Your pie looks delicious! That’s awesome that you can look forward to trying new recipes with the aquafaba – love it! I’m so glad your vegan whipped cream was a success! How interesting! I hadn’t heard of aquafaba. Thanks for sharing! Oh man, way to go, technology! This is what science is for, my friend, and I am not being sarcastic. I’m thrilled you’ve found a substitute that actually tastes good! I have heard of aquafaba but it sounds so ridiculous I can’t quite believe that it really works. However, if you tell me it does then it must be true – and pictures don’t lie either do they? One day I will try it. Meanwhile, I look forward to hearing about Bookman’s Lemon Meringue Pie! For Winter Solstice perhaps? Love the pic of the Dashwoods. YAY! Very exciting INDEED. Happy NEw Year!